Successfully Added High Capacity External Charger and Holder for iPhone 4 and iPhone 4S to your Shopping Cart. The High Capacity External Charger and Holder is the perfect partner for your iPhone 4 or iPhone 4S. 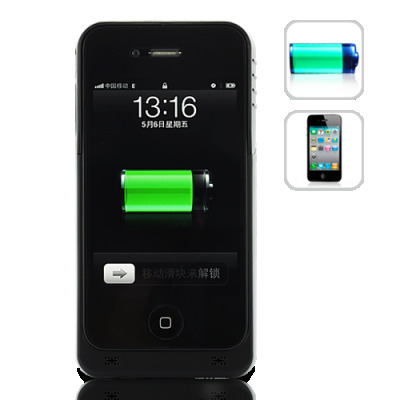 The External Battery Charger is designed for charging your iPhone 4 and your iPhone 4S at anytime and anywhere, it can also provide protection of a hard-shell case, all in the form of a non-slip, soft grip case. The up-to-date look of the High Capacity iPhone 4 or iPhone 4S External Charger makes sure that your iPhone 4 or iPhone 4S never looks out of place no matter the situation while offering a soft-touch finish which gives a secure and comfortable grip on the go. Say goodbye to chunky additions to your iPhone 4 or iPhone 4S that can make it uncomfortable or even nearly impossible for it to fit in the pocket of your pants. Most importantly, it fully charges the phone with a single USB cable. Just charge it up by connecting the iPhone 4 or iPhone 4S charger to your PC using the included USB cable. No other connectors to choose for your iPhone 4 or iPhone 4S when you are out and about. With the high capacity of battery (1900mAh), did you know that you can get more? Talk more, text more, surf more and play more with the iPhone charger. Additionally, it gives on-the-go power for the iPhone 4 or iPhone 4S. Then you can enjoy your iPhone 4 or iPhone 4S for voice, music, video, games and business applications with extended, stable power. This iPhone 4 or iPhone 4S accessory gives you the freedom of charging your iPhone 4 or iPhone 4S. Wherever you go, beach, camping, or traveling anywhere; whenever you want, day or night, he will be right here waiting for you. You can get an added security right in your bag if anything does go wrong. This model was designed specifically for the iPhone 4 and iPhone 4S. I bought two of these, (i think you have to). I have a Mophie in which I paid some crazy amount near 70 bucks which is a really great product but very expensive. However these chargers are a bargain at 18 bones a piece which is great deal. I really like the fit of these chargers on my Iphone 4, it seems more snug and fitting. Anywho, pretty good deal no matter which way you slice it and it will get you through the day on a full charge. on 2011-06-28 12:52:09 Fantastic at this point! Got this for my boyfriend as he's *constantly* charging his iPhone4. Has to charge it during the day, at work, at night... It's a hassle for him. Since I got this for him, it's really cut down on how much he has to plug in his phone. Well, it's cut down the amount by about half. He really likes the case, I really like that he's happy with it, so it's all good! I know that the price was certainly right! Thanks ChinaVasion! Aside from that, the one thing that we would like, is for a screen protector to be sent with it. One that would fit - very thin - in the case, over the top of the phone. One that doesn't stick to the screen, but would fit in the case? Not sure how it'd work with the home button on the bottom, though. My boyfriend works around oil and stuff - he machines parts - so most nights he can't use this case at work and the lack of a screen protector is mainly the reason -- the ones that stick to the screen get lifted by the solvents and stuff. Other than that, the product is WONDERFUL so I definitely believe it deserves 5 of 5 stars!